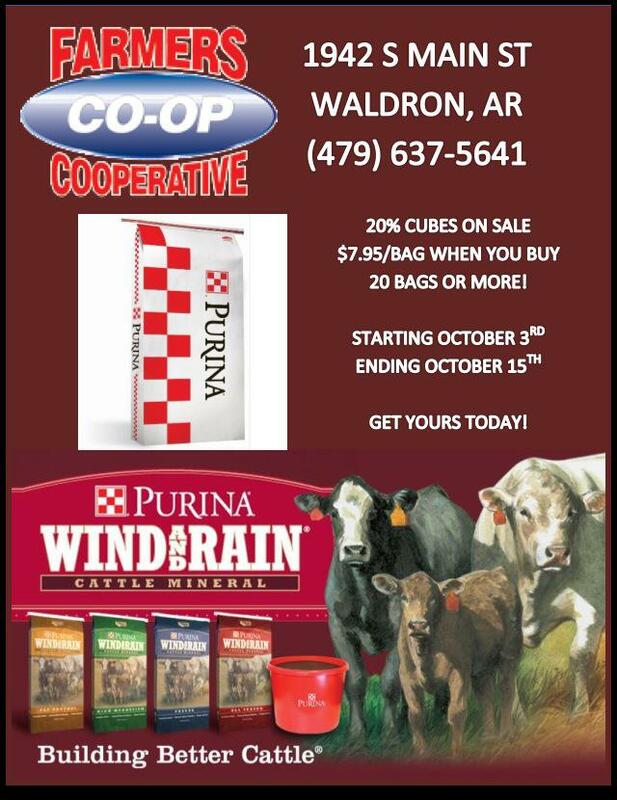 Stock up and SAVE on Purina Cattle Cubes at Farmers Coop in Waldron, Arkansas. October 3rd through Oct 20th, SAVE on Purina 20% Cattle Cubes. Purchase 20 bags or more and pay just $7.95 per bag. That adds up to a GREAT SAVINGS! Purina Cattle Cubes are a 20% all-natural protein cattle cube for cows on fair-to-poor quality forages and grasses. Supplemental protein for beef cows on forage or grass diets – Promotes low-quality forage utilization. Provides flexibility to choose supplement and feeding rate that fits the needs of the individual cattle producer. Feeding rates will vary depending on forage quality and quantity, cow body condition, weather conditions and physiological status of the cow herd (gestation versus lactation). Please consult feed tag sewn onto the bag for specific feeding directions. Sale price valid October 3 through October 15, 2016, at Farmers Coop in Waldron, Arkansas. This entry was posted on Wednesday, October 5th, 2016 at 8:02 pm	and is filed under Cattle, Events, News & Updates. You can follow any responses to this entry through the RSS 2.0 feed. Both comments and pings are currently closed.